Liftoff is set for April 10. 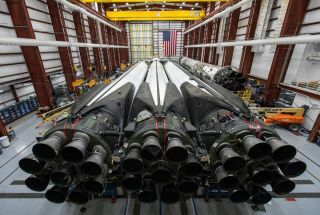 SpaceX has postponed the launch of its first commercial Falcon Heavy mission from NASA's Kennedy Space Center (KSC) in Florida to no earlier than Wednesday (April 10). "Now targeting Falcon Heavy launch of Arabsat-6A on Wednesday, April 10 – weather forecast improves to 80% favorable," SpaceX representatives wrote in a Twitter update today (April 9). Liftoff is scheduled for 6:35 p.m. EDT (2235 GMT) from NASA's historic Pad 39A at KSC. The launch window extends for just under 2 hours. SpaceX had been targeting a launch on Tuesday (April 9) at 6:36 p.m. EDT (2236 GMT). The weather forecast for that target was dismal, with just a 30% chance of good weather at launch time, according to 45th Weather Squadron based at the nearby Cape Canaveral Air Force Station. The upcoming launch will carry the the 13,200-lb. (6,000 kilograms) communications satellite Arabsat 6A for the Saudi Arabian company Arabsat. It is the second flight of a Falcon Heavy rocket (SpaceX launched a test flight February 2018) and the first commercial mission for the new booster. SpaceX's Falcon Heavy is the most powerful rocket in use today. It consists of three first-stage boosters based on SpaceX's workhorse Falcon 9 rockets, all of which are designed to fly back to Earth and land for later reuse. During SpaceX's first Falcon Heavy flight last year, two of the boosters made a simultaneous landing on pads at Cape Canaveral Air Force Station. The core booster narrowly missed its own landing on a SpaceX drone ship in the Atlantic Ocean.